Reserve a Day Charter, Sailing the San Juan Islands, on the Classic Wooden Sloop, ‘Aura’, a Northwest treasure. 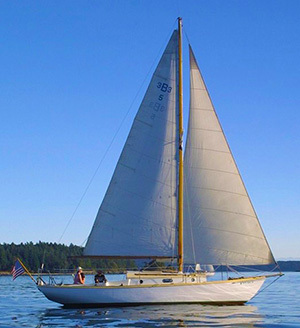 Her classic beauty, roomy cockpit, and steady speed make her ideal for day sails in the San Juan Islands. The Aura sails from Deer Harbor on Orcas Island. 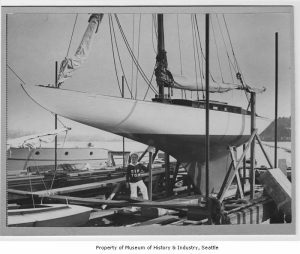 Designed by the great Northwest naval architect William Garden, she’s the fifth of nine built by the legendary Blanchard Boat Company of Seattle in the late 1940’s. 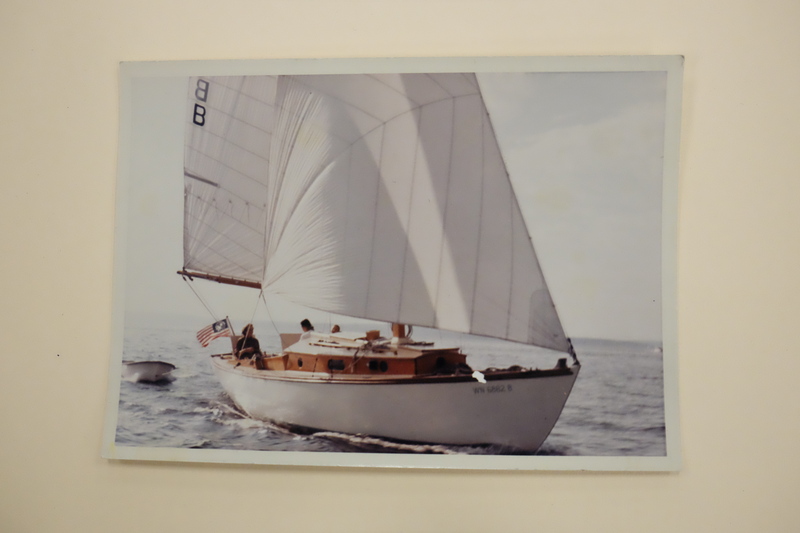 Owned by Norman C. Blanchard himself for 25 years, she has always been meticulously maintained by her owners, true to the tradition of yachtsman-ship before fiberglass. She is a great sloop for day charter sailing the San Juan Islands. This may be “Aura” under construction. A handwritten note on the back of this photo, probably by Norm Jr., says “Aura or one of the 10 or so same hull”. The Blanchard shipwrights usually took about 6 months to build these boats. “Aura” is 33 feet long on deck, and weighs six tons, with two tons in her cast iron ballast keel. Her hull is red cedar planking, over oak frames, on a backbone of fir and yellow cedar. She was fastened with galvanized steel screws, as bronze was hard to come by in the postwar years. “Aura” was first owned by an independent oil geologist from Roswell, New Mexico named J.B. Headley. (I was able dig up on the internet that in 1938, he was one of five seriously injured in a nitroglycerin explosion at an oil well in Hobbs, NM, which killed seven men including the head of the bank financing the project. He was in the group including two bankers and an attorney that had come to inspect the “shooting” of the well using a nitroglycerin time bomb which exploded prematurely!) Somehow he survived, and nine years later he and his family decided they wanted to go yachting and escape the desert in the summer. So it was that J.B Headley walked unannounced into the Blanchard office on East Lake Union one day in 1947. Norman C. Blanchard, son of the founder, and head salesman, showed Mr. Headley around the yard. 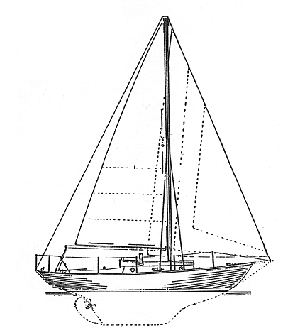 A 33 foot sloop, then under construction on spec, was sold to the Headleys, which they named “Aira.” They owned her for five years, sailing her in the summer, and returning her to Norm Blanchard during the ‘off season.’ Norm would maintain the boat for her owners in exchange for being allowed to sail her when they were in Arizona. Mr. Headley then sold “Aira” to Norm (who mortgaged his house for her) on the condition that he change her name. Perhaps they intended to name a new boat “Aira”. Since it was considered bad luck to change a boat’s name, Norm changed it as little as possible, one letter. 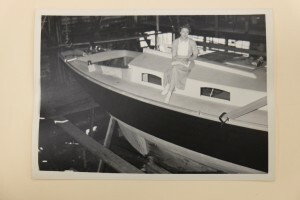 And since Aura is a woman’s name and it’s good luck to name a boat after a woman, even one you don’t know, Aura’s luck has held for over 65 years. He describes the episode in his book of memoirs, “Knee Deep in Shavings”, in the chapter titled “How Aura got her Name”. “Aura” was owned and enjoyed by Norm from 1952 to 1977. He maintained her for 30 years in excellent condition, which is why she still exists today. He, his wife Eunice, and their kids would cruise north into British Columbia every summer. He had the mast shortened to fit under the bridges in Seattle, except the Fremont Bridge.. In an effort to alleviate the serious weather helm problem the boats were designed with, he changed the rig from 7/8 fractional to masthead, and reduced the size of the mainsail on the foot, but refused to but a bowsprit on the boat for aesthetic reasons. Bill Garden redesigned the rig with a bowsprit, but Aura is the only B-33 sloop to be modified that way, by Mike Bailey in the 1980’s. Weather helm is not a problem now. 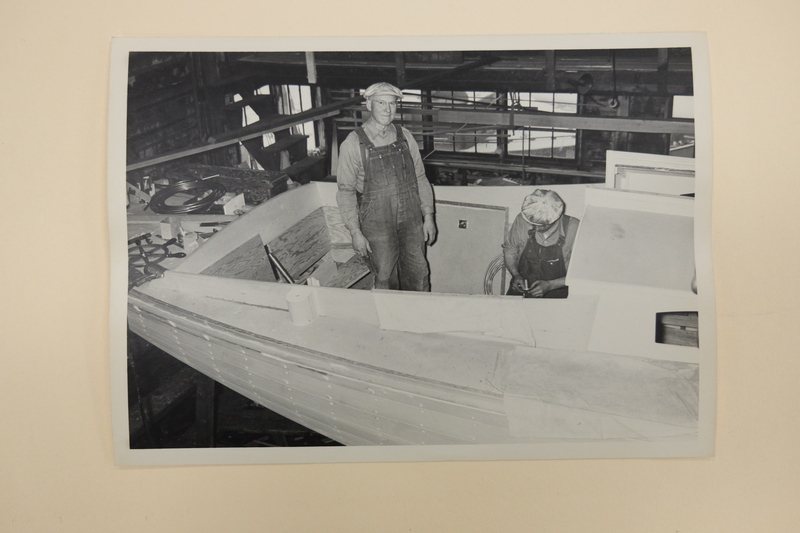 Norm created the famous lazarette hatch covers that swing up to become backrests at the helm. He carved the nameboard which adorns the transom to this day. He kept her at his dock in Portage Bay, near the Seattle Yacht Club. He then reluctantly sold her to buy a powerboat, since he and Eunice were not as nimble as they used to be. 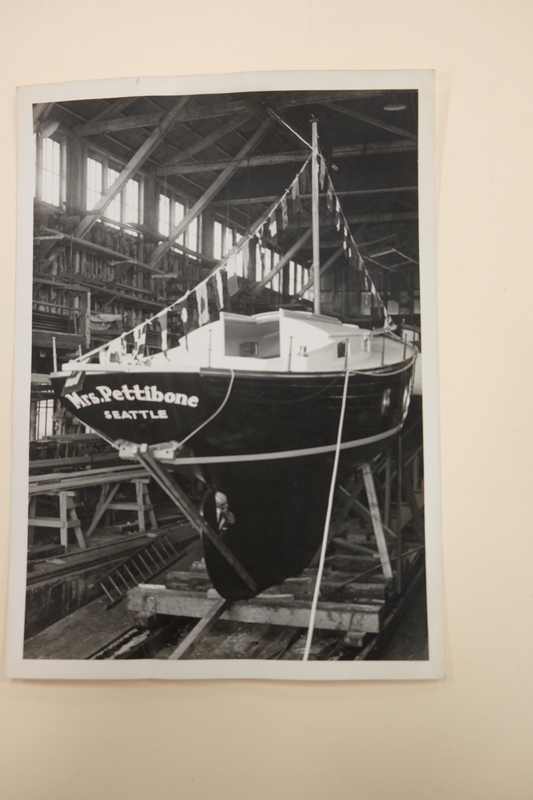 The boat moved to Bellingham in 1977. The new owners wisely painted over much of the varnish, which made her much easier to maintain. Ward bought “Aura” in 1994, and got to meet Norm in 1996. A very gracious and knowledgeable man, he died in 2009 at the age of 98, a true Northwest classic. In the years since Norm sold her, she has had a series of good owners who have kept her in great condition. 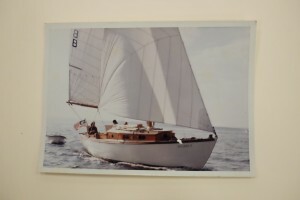 Mike Bailey installed the bowsprit, rebuilt the cockpit with teak, put in new stainless steel water and fuel tanks, and installed bronze stanchions and lifelines. She has had new floors, frames and planking around the mast step, and aft to the engine mounts. In 2017 she received new iron keelbolts. “Aura” is a two-time winner (1997 and 1999) of the Northwest Wooden Yacht Racing Association series. The trophy is on display at the Center for Wooden Boats in Seattle. 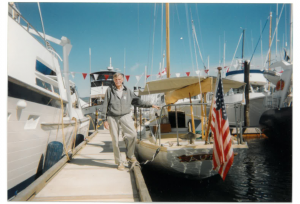 She won “Best Sailboat” at the 1997 Vancouver Wooden Boat Show. 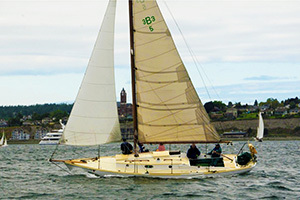 Aura competes every year in the Classic Mariner’s Regatta in Port Townsend, where she often finishes in the top 3 in Class B. 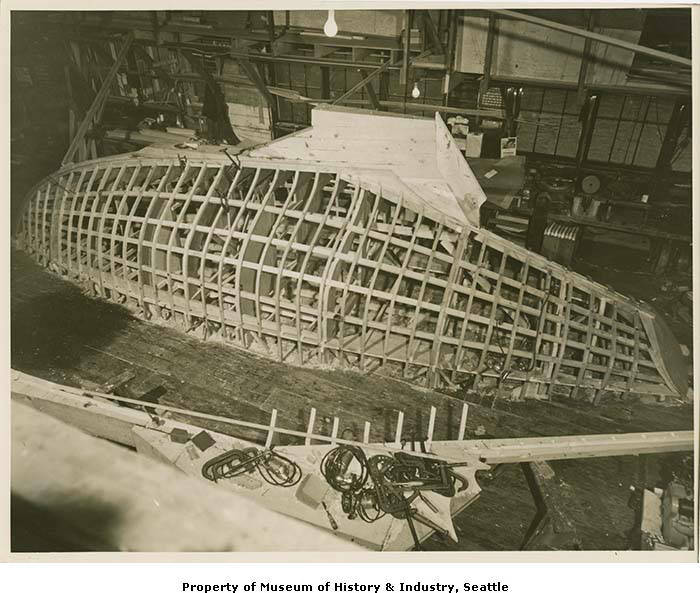 A half-hull model of “Aura” carved by Norm C. Blanchard is in the upstairs dining room of the Seattle Yacht Club. 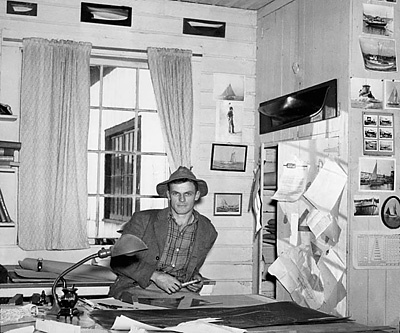 The noted Northwest marine architect, William Garden, then aged 28 years, drew the plans for a 33 foot sloop in 1946, early in his long and diverse career, which ended in 2011 at the age of 92. 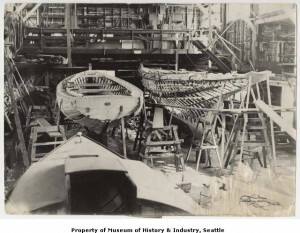 The plans were made for the Blanchard Boat Company on Lake Union in Seattle. 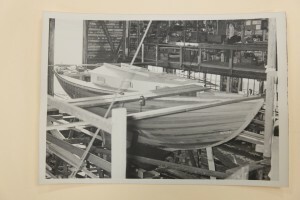 The company was founded by Norman J. Blanchard, an English immigrant from a long line of boatbuilders, after the First World War. 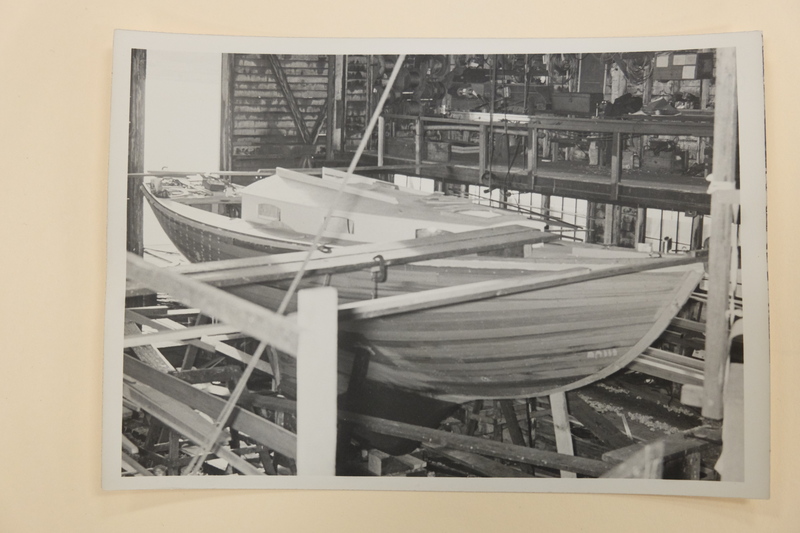 Blanchard Boat Company was one of many high-quality boat builders in Seattle, in the days of abundant local old-growth lumber and highly skilled marine carpenters. Blanchard built 9 boats to this design, one every six months or so. Some were fastened with bronze but most were iron fastened. B-33 #1, formerly in Blaine WA, is being renovated by experienced boat builders north of Spokane but may never see salt water again. One B-33 sailed to Hawaii and may have deteriorated there; one was built in Honolulu with Blanchard’s permission and is probably “Malia,” B-33 #2, still sailing out of Haleiwa. “Malia” has cruised the South Pacific and the Caribbean, going through the Panama Canal both directions. Of the other remaining Blanchard 33’s, only three are known to be in sailing condition, Aura, B-33 #5, Vagabond, and Skylark, #3. “Vagabond” is in Shilshole Marina, and has had a lot of good work done. 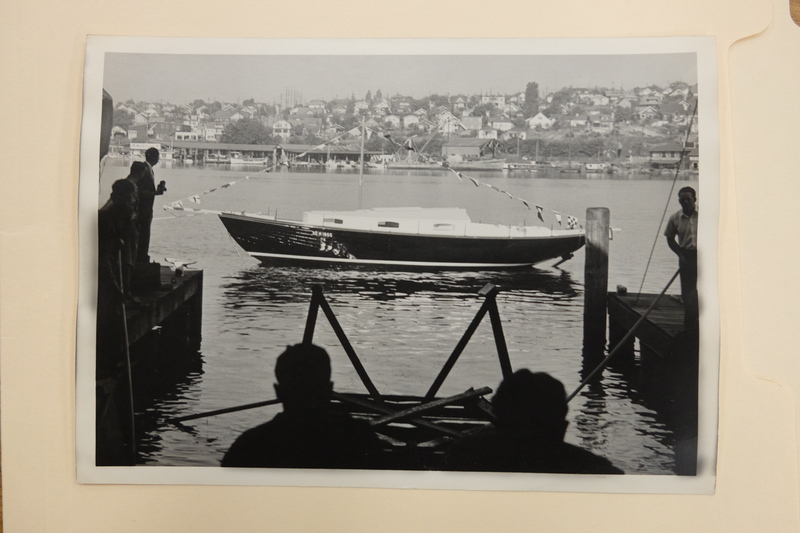 “Skylark” was owned for many years by a marine carpenter in Lake Union, was recently purchased by the son of the man who owned her in the 60’s, and is now in very good hands, having had a nearly complete rebuild at the historic and soon to close Jensen’s Boatyard. “Seawind”, B-33 #4, formerly of the Center for Wooden Boats in Seattle, is sitting well covered on a boatwright’s property near Langley, WA, waiting patiently for someone to find time to repair her, but it is probably too late for her as well.. “Varuna” had much work done, but then was sold for very little to a neglecting owner, and left mostly abandoned on a mooring near the Orcas ferry dock until 2014, then was taken ashore, hopefully for more work, but probably to rot away unseen. Another B-33 in Tacoma was reported as sunk, and has likely been broken up. The 9th and last B-33, named Mrs. Pettibone, was built as a yawl, painted dark blue or black, and was rumored to have been scuttled in Lake Washington for the insurance money. In the humble opinion of Capt. Ward Fay, if enough boaters in the Northwest had as much sense of aesthetics and maritime heritage as they have money, these beautiful wooden artifacts of a bygone age would not be in danger of being lost forever, and would be meeting annually in various shows and regattas, sought after, cherished, and perfectly maintained for generations. “Aura” sailing, back in the day. Note the beautiful varnished mahogany. I first met Bill Garden when I arrived at his dock near Canoe Cove on my way to the Victoria wooden boat festival. I was proud of the way “Aura” looked and wanted to show it to him, however briefly. I was uninvited and unannounced. Had I known his reputation for privacy I would not have stopped. I started to walk up the ramp to his house and he met me and said, “Can I help you?” I told him I had Norm Blanchard’s old boat and was on my way to the festival. “Oh, the little sloop, I’d like to see it'”. So we went on down to the float. He said something nice about how she was maintained, and he thought the stanchions were “high enough to do some good”. Then I got the feeling I should be on my way. Two years later there was the first Garden Rendezvous in Tsehum Harbor Marina. The local boat shops wanted to have a dinner and thank him for his work over the years. Many boats showed up of many different types to commemorate his astoundingly varied output over 50+ years. I sought him out again and asked him to have his picture taken next to Aura. He graciously agreed. The dinner was a big hit; he was unsure if he liked the idea at first, but soon became gratified at the outpouring of admiration by powerful boat industry people, and poor sailors like myself. He knew more about boats than anyone I ever met. He died in 2011 at the age of 92. 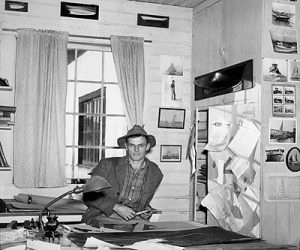 Bill Garden in his shop at Toad’s Landing, B.C. Bill Garden next to Aura in 1998. N.J. Blanchard and others at Johnson Bros. & Blanchard boatyard, Georgetown, circa 1912. I believe N.J. is the man on the right. The two on the left are the Johnson Brothers, and the man in the street clothes is I think N.J.’s brother. In 1905, Norman J. (N.J.) Blanchard (1885-1954) teamed up with his friends, Dean and Lloyd Johnson, to open Johnson Bros. & Blanchard boatyard at the former oxbow of the Duwamish River, near what is now South Hidalgo Street. It was from this yard that the 100-foot motor yacht Helori was launched in 1911 for O.O. Denny. Designed by N.J.’s friend, L.E. (Ted) Geary, it was at that time the largest motor yacht built on the west coast. 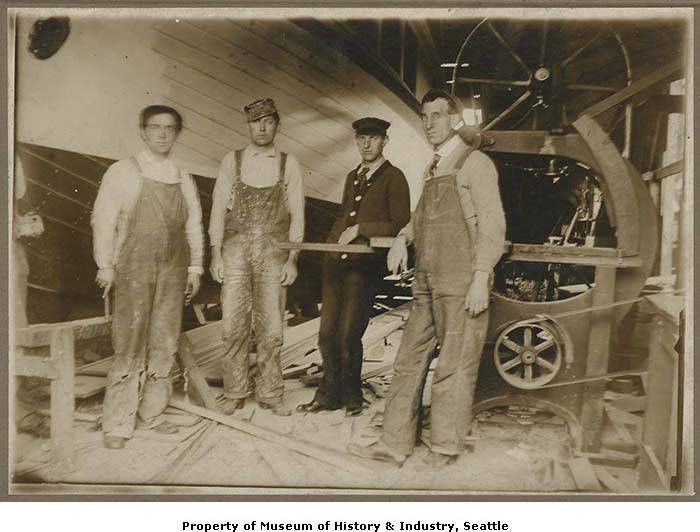 In 1915, after underbidding a job, the yard went broke and closed. 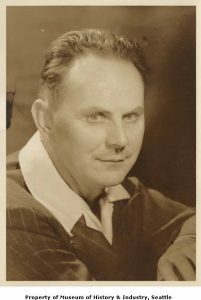 Following N.J.’s death in 1954, his son Norman C. Blanchard (b. 1911), who had worked alongside his father most of his life, succeeded as head of the yard. 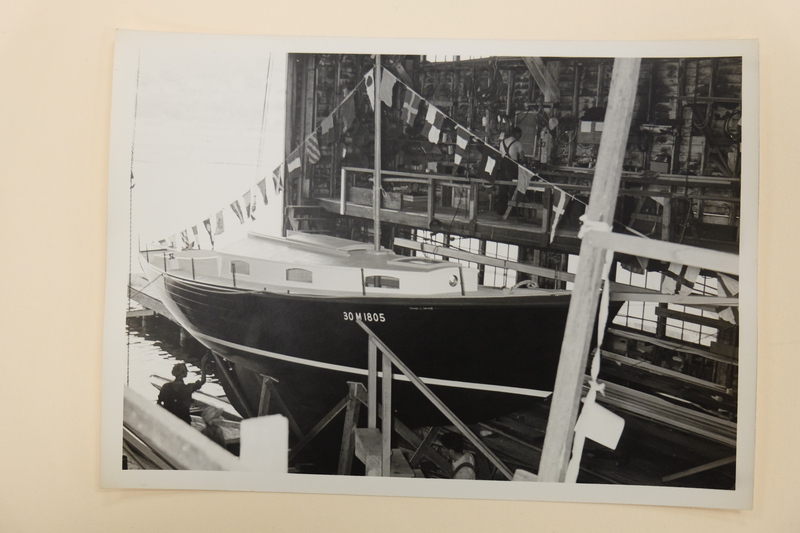 The shift in pleasure craft by this time, however, was toward fiberglass, and much of the work done at the yard in the 1960s was repair work. After over 60 years of operation, in 1969, Norm Blanchard sold the yard. The final tally totals almost 2,000 boats constructed, including sail and power, commercial and pleasure. 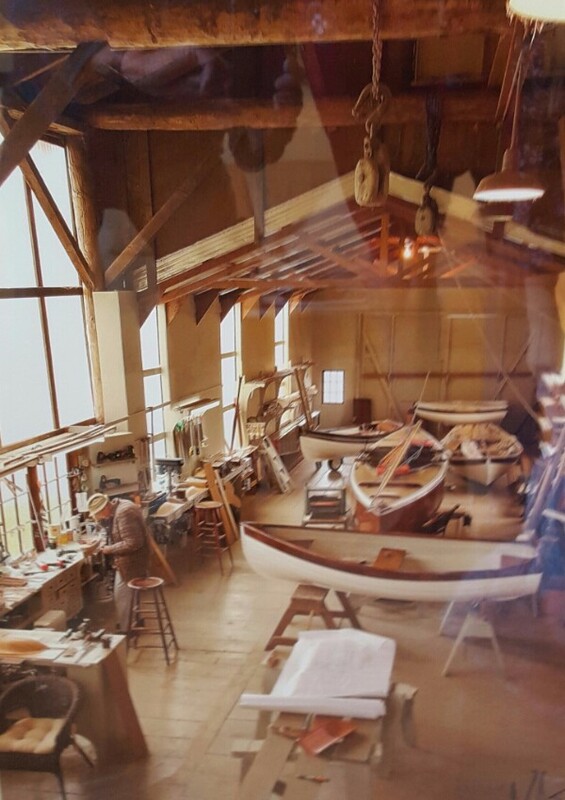 That many of these boats are still in use by proud owners is testament to the excellent workmanship of the Blanchard Boat Company. 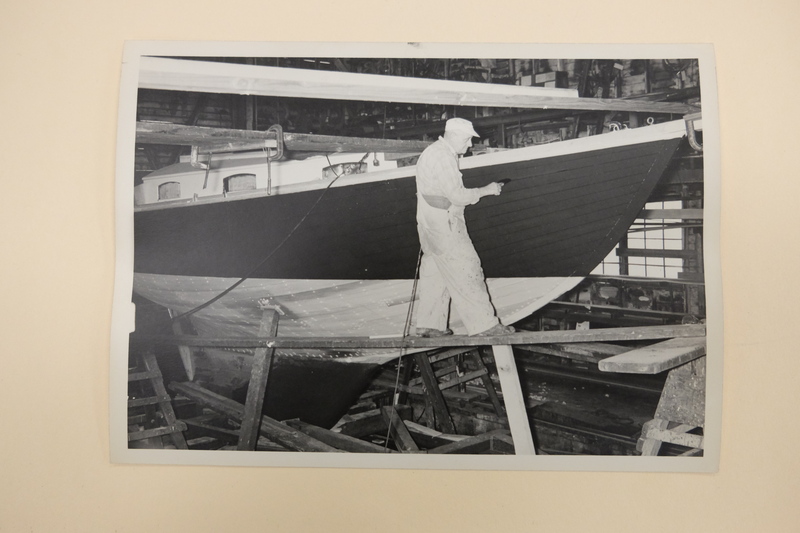 Ten-year-old Norman C. Blanchard stands in front of the sailboat Sir Tom at the Blanchard yard in Wallingford. Designed by Ted Geary and built by N.J. Blanchard and his partners, the sloop was commissioned by a syndicate of ten Seattle businessmen to compete for the Sir Thomas Lipton Perpetual Challenge Cup. The Sir Tom had a long and successful racing life, holding the Lipton Cup continuously from 1914 until 1928. One of the great things about owning “Aura” is her historical significance. She was built in the heyday of wooden boat building in Seattle. Few people are left who remember how it was then. Norman C. Blanchard was in the thick of it from an early age. I got to know Norm and his second wife Mary, a bit in the mid 1990’s. He was then 85, and very approachable and gracious. He didn’t want to talk about the boats as much as he did the people, as befits a legendary boat salesman. His book of memoirs, ‘Knee Deep in Shavings,’ describes those days. 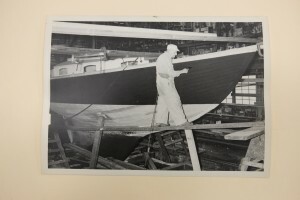 His Dad, N.J. Blanchard, was the old-time shipwright from England, who started his own shop on Lake Union after WWI, and kept it going until he died in 1954. By that time, fiberglass boats were eclipsing wooden ones, and the old man didn’t care to change to the new production methods. 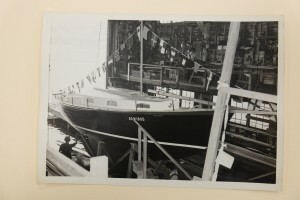 Norm told me that when his Dad died, people didn’t think “little Norm” could keep the business alive, but he did as well as could be expected, doing mainly repairs rather than new boat construction. Blanchard sold out in the early 60’s, shortly afterward there was a fire at the plant, and it closed. Lake Union Sea Ray now occupies the property. Another great story was when Blanchard Boat Co. had a contract to build an Atkin Ingrid to compete in the Ingrid fleet in Los Angeles. William Atkin sent the offfset plans, and one of the lead shipwrights, an old Scot who had worked for the Fife Company in his youth, took a look at them. He pronounced the boat un-buildable according to those offsets, and that it would turn out “lumpy” and slow. He made some modifications to the plans, and the boat was built that way. This kind of thing happened regularly when designers who were not builders sent boat plans to builders. When Mr. Atkin found out that his design had been adjusted, he made it clear he would have nothing to do with it, that it was not a true Ingrid. The boat went to LA, and promptly dominated the Ingrid racing. The other Ingrid racers said when all the boats were hauled out and standing in a row, it was visible why the Blanchard-built one was faster, it being a little bit sleeker. When I met Norm and Mary a few years after I bought Aura, it was at the CWB Festival on the July 4th weekend in 1996. 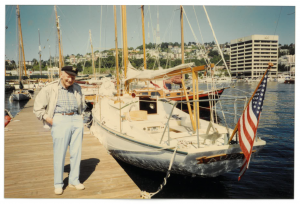 They invited me for lunch at the Seattle Yacht Club, where Norm had more seniority than anyone, having joined in the 1920’s when they had junior memberships. 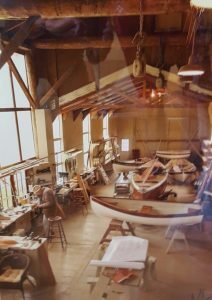 Norm was an accomplished woodcarver, and showed me the half model of Aura’s hull he had carved in the 1950’s, painted light green, with the other half models on the wall of the upstairs club restaurant. He also carved Aura’s name-board, which is still mounted on the boat. The next time I saw Norm was a few years later, when his book had come out, and he was signing copies. I had him sign my copy. He didn’t remember me; age had taken its toll. But I still remember him. He died in 2009 at the age of 98. 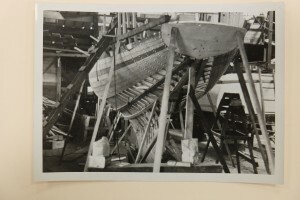 Blanchard 33 #9 under construction, 1951. Shipwrights working in the cockpit. Aura’s cockpit is bigger. I imagine this lady is Mrs. James Moffett, sitting on the cabin top of her new competition. The last Blanchard 33 built, ready to launch, 1951. They had silly boat names even back then. 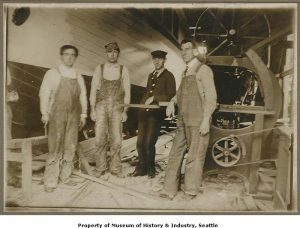 I got these images from the Museum of History and Industry, a wonderful museum now located in the old Naval Armory building at the south end of Lake Union in Seattle, next to the Center for Wooden Boats. Be sure to visit it someday. It looks like the Blanchard shipwrights did their usual excellent job, but the boat was not a success. “Mrs. Pettibone” was a popular party record of the day by Dwight Fiske. B-33 #9 was the only Blanchard 33 rigged as a yawl, had a longer cabin and a shorter cockpit, was painted dark, and was steered with a wheel, all features I don’t agree with. The boat sank mysteriously in Lake Washington sometime in the 50’s. Norm told me of the rumor that she was scuttled for the insurance money.